Humanscale introduces the new Smart Ocean task chair, made from nearly 2 lbs of recycled fishing nets. NEW YORK--(BUSINESS WIRE)--Humanscale is thrilled to introduce the Smart Ocean chair, an inventive adaption of the legendary Diffrient Smart chair that incorporates almost 2 lbs. of recycled fishing net material (NetPlus). Sourced from Bureo, an emerging venture developing innovative solutions to prevent ocean plastic pollution, this is the first tangible product of its new partnership and marks the first product available to purchase from the consortium of companies under the NextWave initiative. The nets used in the production of the new task chair are from Bureo’s Net Positiva recycling program, which facilitates the collection of discarded plastic fishing nets and provides incentives to participating coastal communities. The nets are then transformed into plastic pellets and used to manufacture quality products such as skateboards, sunglasses, and now — for the first time ever — an ergonomic task chair. Founding members of the NextWave initiative, Humanscale and Bureo are leveraging supply chains as a means of keeping plastics out of the ocean. Smart Ocean is just the first solution to come to market. Humanscale plans to replicate material solutions across their product line, supporting the expansion of Bureo’s recycling program and lowering dependency on new plastics. The like-minded companies share a common mission to achieve a net positive impact and are recipients of Living Product Challenge certification. Humanscale was the first company in the world to receive full certification in September 2016. Embarking on a journey to disrupt material sourcing, the two companies will work together to promote environmentally friendly design solutions. Smart Ocean is available to purchase at humanscale.com/smartocean. For high res images and video, click here. Humanscale is the leading designer and manufacturer of high-performance ergonomic products that improve the health and comfort of work life. Through leveraging new technology in functional yet minimal designs, Humanscale transforms traditional offices into active, intelligent workspaces. Committed to making a net positive impact on the earth as well as our customers, Humanscale offers award-winning products designed with a focus on function, simplicity and longevity. For more information, visit www.humanscale.com. Bureo, based in the US and Chile, is focused on finding solutions for the growing issue of plastic pollution in our oceans and initiating social change. Bureo’s Net+Positiva program provides fisherman with environmentally sound disposal points, while Bureo receives highly recyclable and durable raw materials. Headquartered in California, Bureo is a certified B-Corporation, a member of 1% for the Planet, and is a participating company in Patagonia's Tin Shed Ventures Fund, an internal fund supporting likeminded start-up companies having a positive impact on the environment. To find out more visit: www.bureo.co. NextWave is a cross-industry, collaborative and open-source initiative originally convened by Dell Inc., and now led by Lonely Whale. NextWave is developing the first-ever commercial-scale ocean-bound plastics supply chain to keep plastics in the economy and out of the ocean. Founding member companies include General Motors, Trek Bicycle, Interface, Van de Sant, Humanscale, Bureo and Herman Miller. NextWave is supported by global thought leaders in scientific research and environmental advocacy including the UN Environment, 5Gyres Institute, Zoological Society of London and New Materials Institute. For more information, visit nextwaveplastics.org. 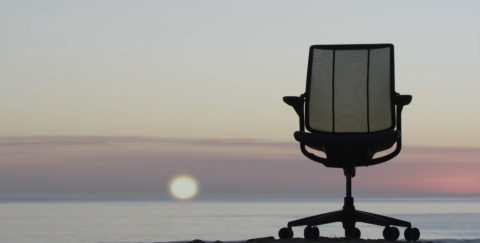 Humanscale's Smart Ocean task chair developed with Bureo incorporates almost 2 lbs. of ocean plastic pollution.